CREATED/MAINTAINED by THEO CHEN. Send comments, questions and suggestions via E-MAIL. Revisit Amanda's 1997 runs at Melbourne & Roland Garros on my Australian Open page and French Open page. Last Update: 4/11/98. You are the [an error occurred while processing this directive] visitor since this page was launched on 4/10/96. Thanks for stopping by! I apologize for the recent lack of updates -- I was on vacation for 10 days and have just caught up. Amanda Captures First Career Tier One Title in Own Backyard! Talk about a fitting place for Amanda to take home the biggest tournament title in her career -- Hilton Head, South Carolina, her adopted home for the past six years. 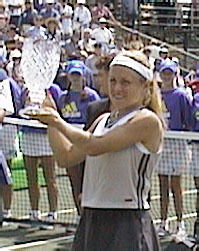 Romania's Irina Spirlea, who had bested Amanda three times in six previous meetings including the 1997 U.S. Open, was unable to overcome Coetzer's consistent groundstrokes and court coverage. In the end, Amanda patiently allowed Spirlea to make mistakes on the slow green clay. Although Coetzer never played a third set en route to her championship, it was not as easy as it may have looked on paper. Rain forced Amanda to play both her second and third round matches on Thursday. Her second-round opponent, Silvia Farina of Italy, had knocked Amanda out of the Lipton just two weeks earlier. Then in her quarterfinal match against Andrea Glass, she barely escaped elimination in a second-set tiebreak, then Glass could not continue due to injury. Add to that the departure of Amanda's longtime coach Gavin Hopper, who during the Lipton reached an agreement to coach Monica Seles after his contact with Coetzer expired. "If I had to pick one title that I would want to have my name on, this would be the one," said Coetzer, the No. 4 seed who had never made it past the quarterfinals of this event in eight previous tries. Spirlea, the No. 9 seed from Romania, was the talk of the tournament, with third-set tiebreaker wins over top-seeded Lindsay Davenport and No. 3 Monica Seles. But Coetzer, a South African who spends about half the year at Hilton Head, drew on her speed and endurance. In a titanic late afternoon slugfest on Centre Court, 1996 finalist Anke Huber of Germany overcame seven double-faults and 72 unforced errors to outlast her doubles partner, ending Amanda's streak of two straight semifinals in Melbourne. As one might expect, it was a tight battle matching Huber's power against Coetzer's speed. "It's a great win because I was down twice, 4-1 (second and third sets)," said Huber. "It's just great to win a match like this, so in the next matches you always believe in yourself if you are down. I think I just started to make less mistakes and I put more balls in. ... I just tried to play a lot of spin and when I had the opportunity go for the shots." At 6/2, 4/1 up in her round-of-16 match against Anke Huber today, Amanda Coetzer looked like a sure thing. At 6/2 4/6 4/1 she again looked unstoppable. It was only when she had lost the third set 5/7 that Coetzer was left pondering what might have been, in a match that was stolen from right underneath her nose. Huber's three set victory over the No. 3 seed was as shocking for Coetzer as it was impressive for Huber. Shocking, because Coetzer was coming off her best year on the tour after winning two singles titles and rising to a career best singles ranking of No. 4. One of the fittest players on tour, the pint-sized (5'2") pocket dynamo looked on track to reach her third consecutive Australian Open semifinal, when she led by what's classified in tennis circles as an insurmountable margin. Let's face it, the only way Huber looked like making an impression was through a freak lightning strike or if Coetzer broke her right arm. What tennis fans witnessed on Centre Court after that game at 4/1 in the second was one of the most fascinating yet frustrating reversal of fortunes they'll probably ever see at Melbourne Park. Huber reeled off five straight games to steal the second set, and came from another 1/4 deficit in the third to take the match in two hours and 10 minutes. Huber, never content to trade groundstrokes with the more agile Coetzer, became the more aggressive of the two in the third set, hitting a total of 48 winners to Coetzer's dismal 12 and punishing the short balls that never made it past the service line. "It's just great to have a match like this, and to win a match like this. You always believe in yourself even if you are down. It's just great and I'm happy that I won," said Huber. And so it was that the girl nicknamed the 'The Little Assassin' by the Australian Open media last year after she thrashed No1 Steffi Graf in the fourth round became 'the assassinated' today. The girl who went on to hand Graf her worst loss ever, 6/1, 6/0 in 56 minutes in Berlin, today experienced what might turn out to be her worst ever trouncing. No10 seed Huber reached her first-ever Grand Slam final here at the Australian Open in 1996 with victories over No2 seed Conchita Martinez and Coetzer in the semis, who she dismissed 6/2 in the third. "I was rushing a little bit at the beginning and I was a little bit lucky in the second set. She gave me a few opportunities to come back, and the crowd helped me out a lot. I started to make less mistakes, I put more balls in and when I had the opportunities I went for my shots. She's one of the biggest fighters and she always gets the ball back. It's nice to know that you are fit enough to beat her like that," said Huber. The 23-year-old German is playing in her ninth consecutive Australian Open, the Grand Slam that seems dearest to her heart. She lists her favourite city in the world as Melbourne, a favouritism reflected in her results. She's reached the third round on two occasions, the fourth round three times, the quarter finals three times and the finals once. "I like Australia very much, the people are great, and I always look forward to coming here," said Huber, who faces No. 7 seed Arantxa Sanchez Vicario in the quarter finals. Amanda's doubles partner, hard-hitting 10th seed Anke Huber, stands in the way of a berth in the quarterfinals. In their last two meetings, Coetzer beat Huber in straight sets in December in Frankfurt, but Huber did the same to her in Perth at the Hopman Cup. Should Coetzer get past Huber, to return to the semis for the third straight year she would have to defeat 7th seed Arantxa Sanchez-Vicario in the quarterfinals unless 16th seed Ai Sugiyama pulls a major upset. Amanda Coetzer (pronounced koot-sur) is one of the top players on the WTA Tour, and, at age 25, already the most celebrated female tennis player ever to hail from South Africa. In January at the Ford Australian Open, she advanced to the semifinals of a Grand Slam for the first time in her career. At five feet, two inches tall, Amanda is the shortest player consistently ranked in the WTA Top 20. She more than makes up for this height disadvantage by running down many shots that would be clean winners against other players. But Coetzer is more than a defensive specialist. Her small frame produces surprisingly powerful groundstrokes, and in 1995 she proved she could win points at the net, too. Amanda hasn't forgotten where she came from, either. This from Tennis Match magazine (thanks Stephane): Amanda Coetzer has an ongoing commitment to develop tennis in her homeland. This summer she lent her support to two South Africans juniors so they could travel to the United States and undergo intensive training they could not receive at home. Thanks to Amanda`s generosity, Chani Scheepers, ranked No. 1 in the 12-and-under girls in South Africa, and Karin Coetzee, ranked No. 5 in the 14s, traveled to Sweet Briar College in Virginia to train with renowned coach Dennis Van der Meer. Coetzer also plans to host a series of clinics at the Free State Stadium in Bloemfontein, S.A., to create wider interest in the sport in diverse communities. "I want to give something back to the area I came from," said Coetzer, "as well as support promising players who might not be able to get the training they need." On this page you will find everything you need to know about this beautiful, determined, incredibly fit, photogenic, and talented athlete. This site will be updated constantly . . . provided I'm not following her around the tour! This site (c) Theo Chen. All photos on this site are for entertainment and personal use only. The photographer is credited if known and retains all copyrights. Please e-mail me if there is a problem with permissions. Title photo by Joey Baking.
. . . the women's tour has happily embraced a new worldwide sponsor, the Canadian computer software company, Corel. It is a natural partnership, with Web Sites and Home Pages all the rage and tennis players and their activities recorded with minute detail on the Internet. Many of the players received Corel software gifts along with computers during the WTA TOUR Championships last November. It has proved to be a lasting addiction, with players like Conchita Martinez and Amanda Coetzer now traveling with "cyberspace" stuffed neatly into their tennis bags. "My boyfriend is starting to feel he might be obsolete," joked Coetzer, who admits she is addicted to tinkering on her computer while on the road, and keeps in touch with everyone by e-mail. I finally had time to check out the site. I was really surprised, thanks it looks great ! I am in Montreal right now, getting ready for the Canadian Open. Thanks again and see you here maybe! Hi Theo Me again, from Montreal. I pressed the send button before I typed who the message was from! Please don't ask me for Amanda's e-mail address because I promised not to give it out. Thanks for understanding. I was born in Burlingame (Ca.) Aug. 10, 1966 but grew up in the Washington DC area. 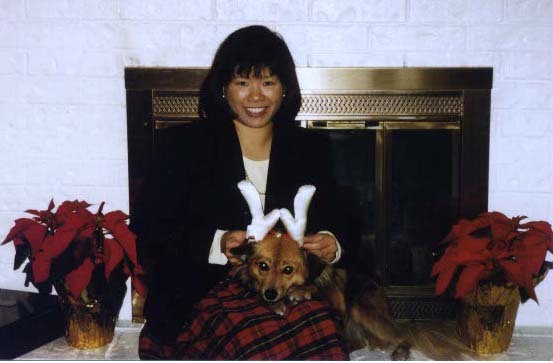 I attended Georgia Tech for a while but graduated from the University of Maryland in College Park. I think I have a pretty cool job. I am the Assistant Manager of Hobby Information for Beckett Publications in Dallas. Basically this entails working with sports, sports cards and sports memorabilia for a living, and since I like all three, I look forward to going to work most every day. Most of my free time is pleasantly occupied by my girlfriend Chavonne, her dog Dolly and cute black cat Monkey. In addition, I enjoy collecting autographs, playing NTN trivia (handle: BEAVIS), maintaining the Texans Against Violence website, visiting art museums (my favorites are impressionists like Monet and Renoir), watching Hitchcock movies, playing CD-Rom games like Myst and Spycraft, and traveling to sporting events across North America: baseball, basketball, football and of course, tennis. I have followed Amanda closely since 1993. So far I've seen her play in the Atlanta Olympics, Montreal, Oklahoma City twice, Philadelphia once, and Toronto three times. Official photographer Joey Baking provided me with a grandiose bio to accompany the below photo of us in Montreal. I won't bore you with that; suffice it to say that his spectacular tennis photography speaks for itself.